An atom is the tiniest component of an element which shares in the element’s properties. Break down matter any further and you’ve got electrons, protons, and neutrons. But these components, electrons, for example, do not share in the element’s properties. An electron is identical to every other electron, regardless of the element in which it occurs. An electron in gold is identical to an electron in the blackest carbon. In contrast, an atom of gold would look gold and an atom of carbon (graphite) would look blackish if you could see anything as tiny as an atom. Gold atoms. 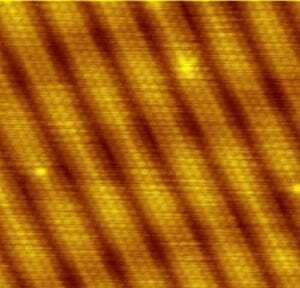 In gold, the atoms at the surface arrange themselves in diagonal columns. Each column is several atoms across. Dark channels form between the columns. Carbon atoms. Carbon atoms arrange themselves into a few forms including diamonds and graphite. When the atoms are arranged in one pattern, they form diamonds. When arranged in another, they form graphite. Both diamonds and graphite are crystals. 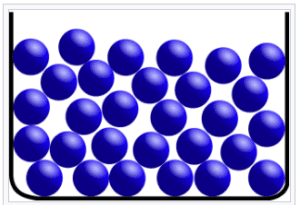 The arrangement shown in the accompanying image is the graphite arrangement of carbon atoms. Graphite is used in making pencil leads among other things. The accompanying images show atoms1It is more accurate to call the little spheres “ions” rather than “atoms.” See the section on ions lower down in this article. of gold, carbon, and silicon in their solid states. These elements are in crystal form because the atoms are arranged in a highly ordered manner. In contrast, atoms in a liquid or gas would float about freely, as shown in diagrams lower on the page. Each atom appears as a little spherical cell. While it’s not possible to capture in a still image, all atoms, whether in a solid, liquid, or gas, jiggle about rapidly. They vibrate. How these images of atoms were made. These images of atoms were created by a high-powered microscope called a “scanning tunneling microscope.” An ordinary microscope, which relies on light to form an image, would not be sufficiently powerful to allow us to see atoms. 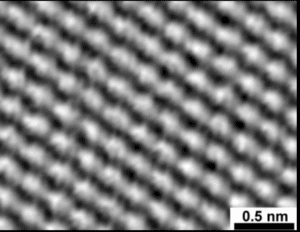 Instead a scanning tunneling microscope uses a stylus with a tip made of a single atom to probe or “feel” materials, atom by atom. The electronic display of the microscope creates an image that is formed by what the probe has felt. In liquids, just as in solids, atoms vibrate rapidly. In addition, in liquids, atoms bump into each other and slide past each other. Unlike the atoms in solid crystals, they are not arranged in a stable, orderly manner. However, the fundamental components of most liquids are not atoms, but molecules2In addition, many liquids are made of ions. . For example, liquid water is made of molecules formed by the bonding of two hydrogen atoms with one oxygen atom. 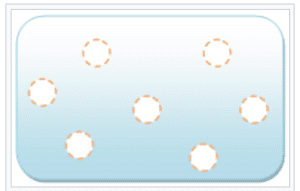 (See a diagram of a water molecule lower on the page.) Liquid helium, which liquefies at a temperature near absolute zero, is an example of a liquid formed by atoms rather than molecules. It took me a while to find an example of a liquid formed by atoms. In a gas, the atoms vibrate with large spaces in between. A few gases, like pure helium, are made up of individual atoms vibrating about in disorder. However, most gases, like most liquids, are composed of molecules rather than atoms. Even pure oxygen gas, an element, is formed by two oxygen atoms bonded together to form a molecule. Thus, oxygen gas is referred to as O2, referring to two atoms. This is the form that oxygen takes in air which we breathe. Carbon dioxide, another major component of the air we breathe, is formed by a carbon atom bonded with two oxygen atoms. The symbol for carbon dioxide is CO2. A diagram of a carbon dioxide model appears lower on this page. 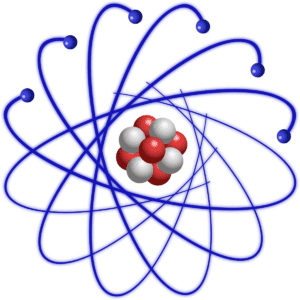 Atoms are made of a nucleus surrounded by an electron cloud. Click on the image to see an animation of the structure of an atom. The video shows some of the subatomic particles that make up an atom. The text underneath the video explains that it’s showing a nucleus of protons and neutrons surrounded by electrons. All atoms take this form. Even though an atom of carbon, let’s say, is quite different from an atom of gold, they’re both made of the same components: a nucleus of protons and neutrons surrounded by electrons. The differences between carbon and gold (or any other element) are due to having differing numbers of protons. While the video says that the different elements have differing numbers of electrons, it’s really the number of protons that define each element. In fairness to the video, usually, though not always, an atom has the same number of protons as electrons3Atoms which have a number of electrons out of balance with the number of its protons are called “ions.” See the section on ions lower down in this article. . If you would like to know the number of protons in each element, see the Periodic Table of Elements. Each element has one more proton in its nucleus than in that of the prior element on the table. Carbon atom. As shown in the accompanying diagram, carbon has 8 protons (red) and 8 neutrons (white) in the nucleus. The nucleus is surrounded by 8 electrons (blue). This particular combination of protons, neutrons, and electrons can result in a black, somewhat soft, shiny substance made of crystals that slide over each other—graphite, like in pencil leads. When arranged in another manner, carbon atoms can form diamonds4Carbon atoms can arrange themselves into different forms of matter, including graphite and diamonds. Both are made of the element, carbon, yet, their properties are very different. Well, that’s Mother . Chunk of graphite, one form that carbon atoms take. orbit the nucleus the way that planets orbit the sun. A better metaphor for electrons would be that each is a vibrating cloud, vibrating throughout a region around the nucleus. The curved blue lines of the carbon atom are meant to suggest vibrations. In addition, of course, particles within an atom do not have color. Oxygen atom. As shown in the accompanying diagram, oxygen has 6 protons (red) and 6 neutrons (white) in the nucleus, surrounded by 6 electrons. The nucleus of the atom is composed of neutrons and protons. Neutrons have no electrical charge, but each proton has a single positive electrical charge. The protons in the nucleus give the nucleus an overall positive charge. Each electron, on the other hand, has a single negative electrical charge. Commonly, within the atom, each proton in the nucleus is balanced by an electron vibrating around it. The positive and negative charges balance each other, canceling each other and yielding an atom that is electrically neutral. For this reason, we can touch matter made of atoms without continually receiving electrical shocks. As mentioned, most matter that we deal with in daily life is made up of atoms joined together in molecules rather than individual atoms. The atoms of the element, carbon, for example, join with atoms of the element, oxygen, to form molecules of carbon dioxide. Carbon is a black solid, and oxygen is a colorless gas that our bodies breathe. They join to form carbon dioxide, a colorless gas that, if breathed in excessive quantities, can poison us. As this example demonstrates, when atoms of elements bond with atoms of other elements to create molecules, the molecules take on properties that often bear little or no resemblance to those of the original atoms. Carbon dioxide molecule. 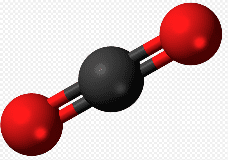 A molecule of carbon dioxide is formed by two oxygen atoms, shown in red, bonded with a single carbon atom, shown in black. Metals not composed of molecules. Metals, however, are a special case–many metals are not composed of molecules. As shown in the image of gold atoms at the beginning of this article, the atoms arrange themselves in an organized structure, called a “lattice.” The nuclei of the atoms are held together in this strong lattice structure. But, the electrons flow about freely, not bound to individual atoms. Each nucleus carries positive electrical charge due to the positive charge of protons within it. The electrons are negatively charged. Opposite charges attract, and the sharing of electrons bind the positive nuclei together. Ions. It’s more accurate to call the gold nuclei in the metal lattice “ions” rather than “atoms.” An atom is a nucleus with a full complement of electrons so that it has no overall electrical charge. An ion is an atomic nucleus that carries an electrical charge. An ion is positively charged if it has a deficit of electrons and negatively charged if it has a surplus of electrons. Rather than individual atoms or molecules, the metal lattice is formed by positive ions in a sea of electrons. If we were to touch the lattice form of gold with an electric current, the free-flowing electrons would conduct the electricity easily. While gold is an excellent conductor of electricity, it would be too expensive to use in electrical wires. Gold and other metals which are formed by ions are good conductors of heat as well as electricity. In the case of a few such metals, like iron, the free-flowing electrons also render the metal magnetic. An atom is 1/100,000 the width of a human hair, a human hair being one of the smallest things that we can see with our bare eyes. In other words, if we could place 100,000 atoms side-by-side, they would span the width of a human hair. Another way to describe the size of an atom is that there are more atoms in a glass of water than there are glasses of water in the oceans of Earth. While all atoms are tiny, they do vary in size. The atom with the biggest radius, cesium, is nine times wider than the atom with the smallest radius, helium. Are all atoms identical if they are of the same element? This question has a subtle answer. On the one hand, we can say that atoms are made of the same components (protons, neutrons, and electrons). And every proton is identical to every other proton; every neutron is identical to every other neutron; and every electron is identical to every other electron. Since atoms of the same element have the same number of each of these components, we might think that atoms of the same element are identical. On the other hand, two atoms of the same element can differ because: 1) They might be different isotopes, that is, have different numbers of neutrons in their nucleus, 2) They might be different ions, that is, might have different numbers of electrons, and 3) Their component subatomic particles might be in different quantum states. An example of a different quantum state would be an electron that has higher energy than another electron. For these reasons, two atoms of the same element might be measured as different from each other. However, each atom has exactly the same potential to be like any other atom. All atoms of an element have exactly the same potential to become a particular isotope, a particular ion, or to take on a particular quantum state. Atoms and the subatomic particles within them can be completely described by mathematical equations. It’s not necessary to provide samples of a particular atom. It’s fully describable by the equation for every atom of the same type, that is, of the same element (allowing for differences due to the three factors listed above). How do atoms form magnetic materials? Here is a simplified explanation. For more precision and detail, see magnetism. Each electron is a tiny magnet, having a north and south pole. But in most materials, the electrons are oriented every which way so that the north pole of one electron points in a different direction from the north pole of another. When not aligned, the magnetism of the electrons cancel each other, and overall, the material formed by the atoms does not display magnetism. Imagine the free-flowing electrons of a metal. Each electron has a north pole (blue) and a south pole (red). In the image to the left, the electrons point every which way so the metal is not magnetic. However, in a few elements, like iron, the north poles of the electrons are capable of being aligned so that they all point in the same direction. A magnet held near a piece of iron can create this alignment. When this happens, the iron has been magnetized. Now, all the electrons are oriented with their north poles in the same direction, and they create a magnetic field around the piece of iron. The ancient Greeks, notably the philosopher, Democritus (about 460 BC to 370 BC), proposed that matter is made of tiny individual particles. The Greeks called these particles atomos. 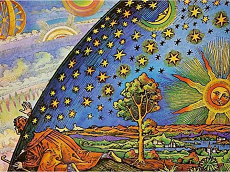 The word meant “cannot be divided.” Democritus believed that a small number of different types of atoms were arranged in a variety of patterns to form all the matter that we see around us. After more than 2,000 years, scientists have, finally, been able to confirm the basic notion of Democritus that all matter is made of a small number of different types of atoms, the different atoms of the 100 or so elements. However, today, we know that atoms, themselves, can be further divided into even smaller particles. So, the ancient Greek name atomos “cannot be divided” is not as applicable as Democritus had hoped. 1 It is more accurate to call the little spheres “ions” rather than “atoms.” See the section on ions lower down in this article. 2 In addition, many liquids are made of ions. 3 Atoms which have a number of electrons out of balance with the number of its protons are called “ions.” See the section on ions lower down in this article. 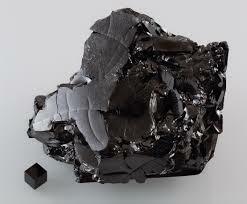 4 Carbon atoms can arrange themselves into different forms of matter, including graphite and diamonds. Both are made of the element, carbon, yet, their properties are very different. Well, that’s Mother Nature for you! It’s so hard to make simple statements about all this stuff because nature is subtle and complicated.It’s so simple to say that everything around us is made of about 100 elements, and that each element has different properties. But then, one has to add, oh, and sometimes those elements can have different arrangements of atoms. And when arranged differently, they have completely different properties and form completely different materials....Albert Einstein famously said, “Subtle is the Lord, but malicious He is not.” [Remark made during Einstein's first visit to Princeton University (April 1921) as quoted in Einstein (1973) by R. W. Clark, Ch. 14. https://en.wikiquote.org/wiki/Albert_Einstein]In conclusion, while atoms are the smallest particles that share in the properties of their element, the properties of matter depend not only on the type of atom but also their arrangement. 5 Frank Wilczek, The Lightness of Being; Basic Books, 2008, New York; pages 33-34.